On Monday 23 November, Projects Abroad presented donations of medical supplies to the National Cancer Institute (NCI) in Colombo, Sri Lanka. A placement for Projects Abroad Medical volunteers, NCI is the country’s largest public oncological hospital. Medical Coordinator Malsha Piyumi donated the equipment with the assistance of Volunteer Coordinator Dinusha Thirimanna, after discussing the hospital’s needs with the directors of its various wards. 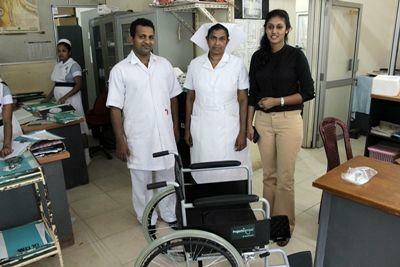 Projects Abroad staff member and local staff from the National Cancer Institute stand by a wheelchair that was donated to the male medical ward. “Through the generosity of our volunteers, we were able to purchase equipment for several NCI wards using funds from programme fees,” remarked Malsha. “These donations form an important arm of our giving to the hospital, and complement the service of our Medical volunteers,” she added. NCI has been a placement for Projects Abroad volunteers since July of this year, when two nurses offered their expertise to the hospital. Since then, Projects Abroad has offered many more nursing students and qualified nurses the opportunity to gain practical skills and experience at NCI. Volunteers have offered the hospital critical support, both in terms of their personal efforts and donations such as this made through their financial contribution. “Our relationship with NCI started with a Teaching project, curiously enough,” noted Country Director Gishan Perera. “When a group of nurses from the hospital were headed to Australia for a workshop on bone marrow transplants, Projects Abroad stepped in to provide English lessons. One year later, we are operating a successful Medical volunteer placement at NCI. All of our volunteers know that a portion of their programme fees directly supports their project sites. The chance for a volunteer to participate in the allocation of these funds through donations is not a unique one, but a special opportunity,” he shared. Projects Abroad will continue to work closely with NCI, and contribute directly towards the work of the institute through the generous contributions of our volunteers.